While eating at Hot Pot, Hot Pot! 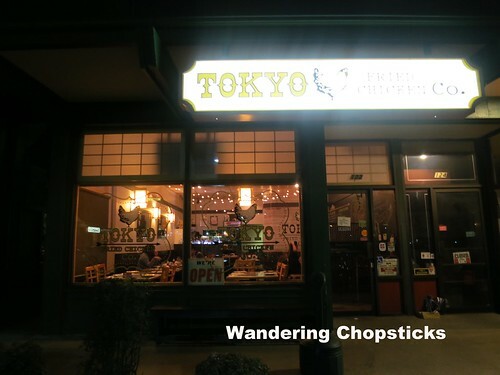 - Monterey Park, I noticed a crowd of people waiting in front of The Open Door, a Japanese fusion izakaya located in the same corner of Atlantic Boulevard and Garvey Avenue. I made a mental note to check it out, but wasn't in any hurry because there was a no photo policy and well, no photos means no point in going, right? 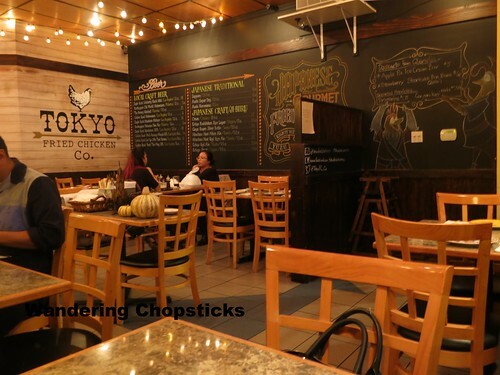 Then in August 2013, The Open Door shuttered and reopened as Tokyo Fried Chicken Co. Same owner, different menu. Apparently, the rebranding also meant a loosening of the no photo policy. 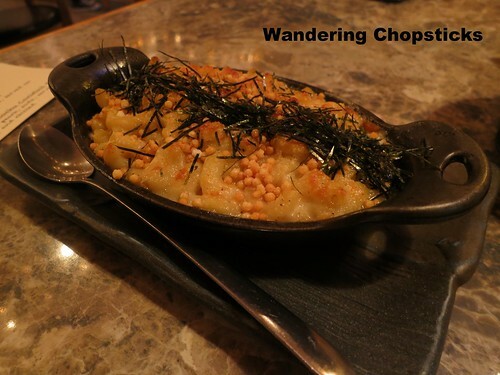 While the menu now focused on fried chicken, that didn't mean the Japanese fusion dishes were gone completely. 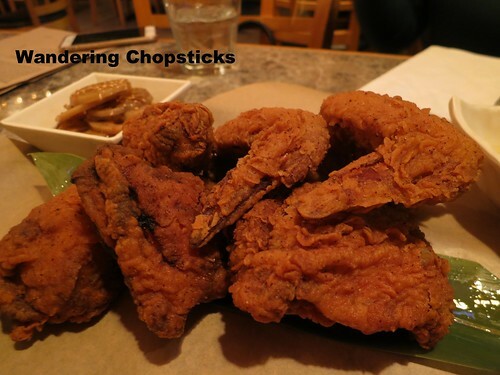 On a quiet weeknight, lil' sis and I finally got around to checking out Tokyo Fried Chicken Co. 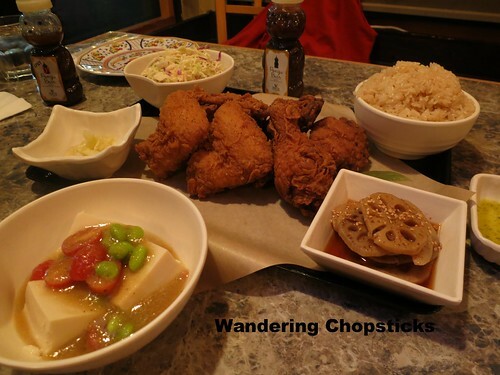 The dinners are sold in sets of two, three, or four for $13.25 per person and includes three pieces of chicken and one side dish for each person. Rice and house pickled cabbage is also included. 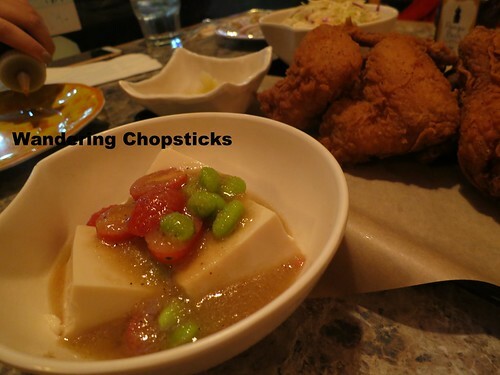 The sets are mixed chicken leg and thigh, although a breast substitution is available upon request. Side dishes include: coleslaw, cabbage salad with house dressing, cold tofu with house dressing, creamy potato salad, soy glazed candied carrots with bacon, kinpira renkon (Japanese sauteed lotus root), soy glazed yams, dashi braised collard greens with bacon, curry creamed corn, and bbq baked beans. If you wanted more than the number of free sides included in your chicken set meal, then the sides are $2.70 each. There were also upgraded sides for an additional $1.70 or $4.20 a la carte that included: fried brussels sprouts with goat cheese and karashi mustard, shishito peppers with den miso and arare, and miso ratatoille. The mac and cheese was $2.80 as an upgraded side or $5.50 a la carte. 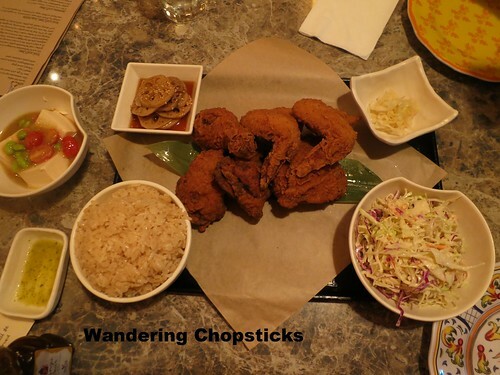 As you can tell by the description, the side dishes were the usual American fried chicken complements, but with a Japanese fusion twist. 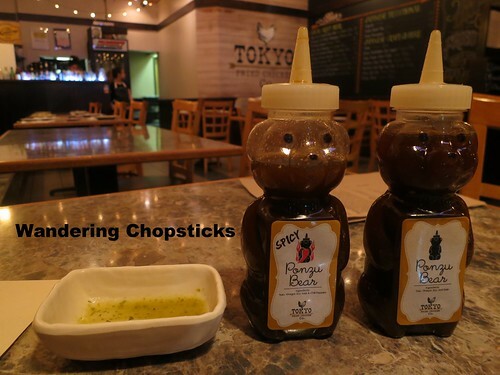 After placing our order, the waitress brought out the housemade ponzu sauces. I love ponzu, but the little dish of yuzu sauce was my favorite. More citrusy without the soy sauce and vinegar to overpower the yuzu. Lil' sis got the breast meat substitution while I stayed with the dark meats. A wing for each of us was the third piece in each chicken set. You can also order additional chicken pieces a la carte as well. 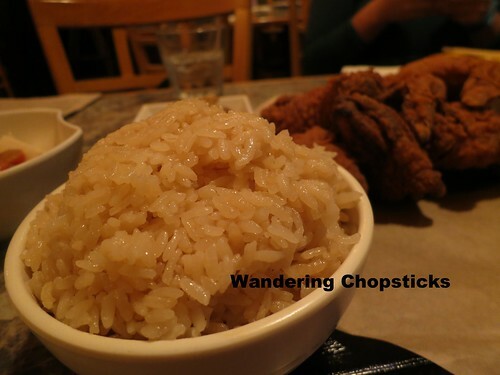 The rice that came with our order tasted like chicken rice, savory and seasoned. 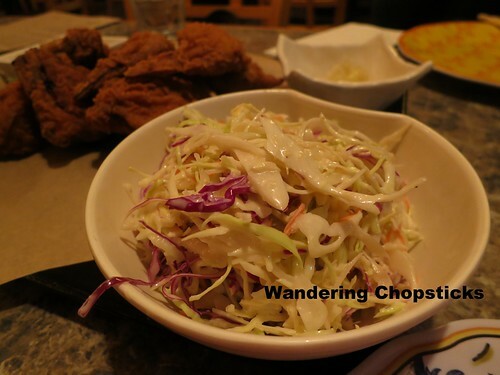 We opted for coleslaw to offset the greasiness of the fried chicken. The cold tofu with house dressing was refreshing. I was expecting the fried chicken to be like Chicken Karaage (Japanese Fried Chicken), but it just tasted like American Southern Fried Chicken. Don't get me wrong, the chicken was juicy, the skin was crispy. It was good fried chicken. Just nothing that screamed Japanese fried chicken, if you get what I mean. I also couldn't resist getting the braised lotus root, but not sure it was worth the additional $2.70 for a third side dish. 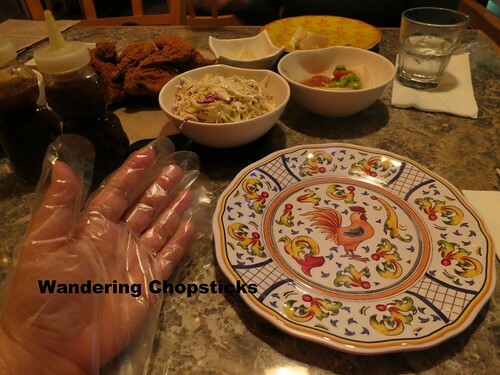 We each got a plastic glove so we could eat the fried chicken without dirtying our hand. Although much appreciated, I found it easier to eat without the glove. Cute rooster plate! After digging in, our a la carte mac and cheese, $5.50, came out. This was sooo good! So flavorful! Miso mac and cheese maybe? I'm not sure what was in it, but it was so savory, crispy on top with the little crunchy bits and shredded seaweed. Next time, I don't think I'd get extra sides above what's included in the set because that was a lot of food! But I'd definitely upgrade to get the mac and cheese. We had plenty of leftovers and the next day, the rice and braised lotus root made a great lunch. Although, I enjoyed it more as just a Japanese lunch, and not as side dishes to fried chicken. Thursday to Saturday 5:30 p.m. to 11 p.m.
3 years ago today, Happy Year of the Dragon! 5 years ago today, Indonesian Beef Rendang. 6 years ago today, Chai Black Tea. 7 years ago today, French Bread Pizza. 8 years ago today, a cold frost decimated most of my garden, except for my iceberg roses and three strawberries.